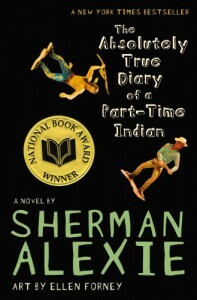 The Absolutely True Diary of a Part-Time Indian - Sherman Alexie, Ellen Forney - review - I'm a reader, hear me roar! This was my first novel told from an Indian's point of view. 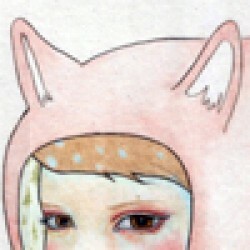 It deals with racism and being a teenager and being weird.I loved the art. The comic strips were adorable and authentic and I think they did match Junior's character.Junior was such a smart character. I loved him right from the beginning. He's Indian, he's a nerd and he's seen as a loser in his reservation. But he isn't a loser. He wasn't one for me. I think it was a rather smart move of him to go to an "all white"-school. There he has the chance to make something out of him and not end like most of the people that he sees day to day on the reservation.The story was fast-paced and had quite a lot of twists that I didn't expect. Junior told his story pretty casual, I liked that very much. But there were also serious parts, which still came off as authentic despite the casual writing style.The racism played quite a big role in this novel and it was executed as well more casual than I expected. It was nothing new for Junior that he was left out and he just accepted it. It was kind of his legacy. I was quite shocked that the racism is still in the 21st century(!!) that kind of a problem. I would've thought that the actual immigrants should feel sorry for rotting most of the Indians out. That they feel like they own everything makes me speechless.I've also heard that this is a banned book and I don't really understand why you should ban this book, let alone any YA book in schools or libraries. I think it deals with quite a few topics that are just what they are - real and true and authentic. Why do books even get banned? You cannot lock everything bad that is mentioned in any book away. I don't think that this is a solution, but that's a completely different topic.The Absolutely True Diary of a Part-Time Indian was a great novel. I liked it a lot.